Fortuna is a picturesque nineteenth century villa and garden developed from 1857 by two of Australia's wealthiest gold magnates, Christopher Ballerstedt from 1854 and George Lansell after 1871. It was developed on the treatment site for ore from nearby gold mines. It comprises the villa, lake and garden at the centre of the site, with the former gold processing buildings to its north, and army structures which were added around the periphery of the site after 1942. The Bendigo goldfields were discovered in 1851, and the surface gold was soon traced to gold-bearing quartz reefs, which proved to be the deepest and richest in the world. The German immigrant Christopher Ballerstedt and his son Theodore were among the earliest successful reef miners on the Bendigo diggings. In 1854 they bought for £60 a mining claim on Victoria (or Chum) Hill (VHR H1355) to the north of Fortuna, and obtained from it gold worth nearly £200,000. 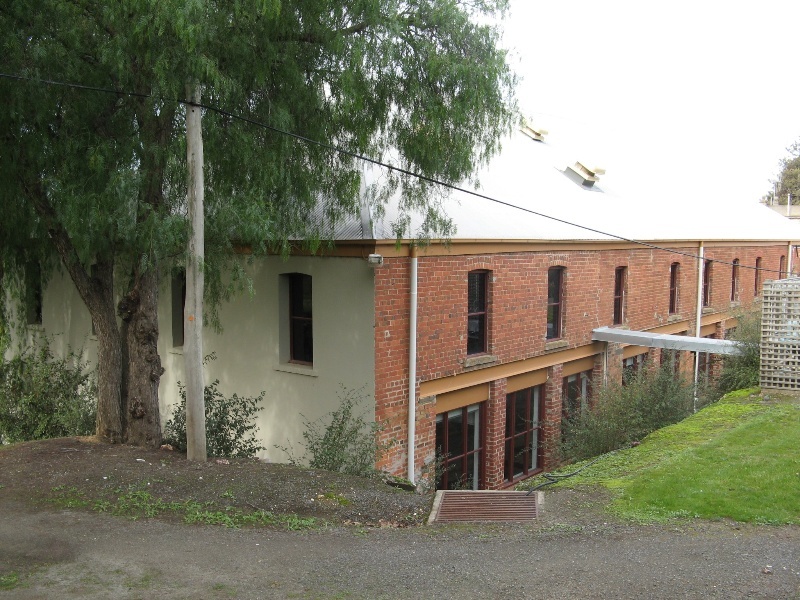 Christopher bought the Fortuna site in 1857 and by 1858 had built a quartz-crushing mill on the site, as well as a modest two-storey brick house, which he extended in 1869 to designs by the Bendigo architects Vahland & Getzschmann. Christopher Ballerstedt died in 1869 and in 1871 his son Theodor sold Fortuna and the mine on Victoria Hill to George Lansell for £30,000 and returned to Germany. Lansell (1823-1906) had migrated from Kent in 1853, and from 1855 invested in quartz mining companies. His confidence in deep mining began to yield returns in the 1860s, and after acquiring Ballerstedt's mine he sank it even deeper, soon finding £180,000 worth of gold, which became the basis of his enormous wealth. He became a millionaire and was known as 'Australia's Quartz King'. He was to have interests in almost every mine in Bendigo and was famous for his tireless efforts to maintain the town's mining industry. He transformed the Fortuna site, with the villa continually altered and extended to successive plans by various prominent Bendigo architects: Vahland & Getzschmann, Emil Mauermann and William Beebe. By the early twentieth century the house had become a mansion of over forty rooms, one of the largest in Victoria, lavishly decorated and furnished with pieces collected from around the world. He transformed the industrial landscape of settling ponds and tailings dumps into spacious gardens with ornamental lakes, extravagant fountains and follies, pathways and exotic plantings. On Lansell's death the management of his mining interests was taken over by his son, and his widow Edith continued to live at and develop Fortuna until her death in 1934, when the house and its contents were sold. The house was used for a short time as a reception centre until acquired in 1942 by the Commonwealth as the headquarters of the Australian Survey Corps, accommodating the army's cartographic and printing activities during World War II. From then until 1996 it was occupied by the Army Survey Regiment, which became a world leader in developing technologies for use in automated mapping systems, and from 2000-2008 by the Defence Imagery and Geospatial Organisation (DIGO). The Army made several significant changes to the grounds, including the construction of buildings for accommodation, messing and office space, the earliest of which are two c1940s P1 type huts, a building type developed by the military for temporary accommodation during World War II. Fortuna is located on an elevated irregularly-shaped 6.74 ha site overlooking Bendigo. It is located on the New Chum Reef, where during Lansell's occupation there were several active shafts (though none on the present Fortuna property). The property is entered from Chum Street through wrought iron gates (1900) supported by granite pillars (c1880s) linked by a decorative iron archway bearing the Army Survey Corps crest. The driveway leads past an Army Survey memorial cairn (1996) to the villa, which is surrounded by a garden wall (1860s) which once separated it from the surrounding mining activity. The villa (1858-1907) is a rambling three-storey asymmetrical rendered brick mansion, in a variety of styles, predominantly French Second Empire and Queen Anne, reflecting the various periods of construction. Cast iron balconies (c1900) decorate the north, east and west elevations. Ballerstedt's original modest house is retained, though much altered, in the centre of the present house. 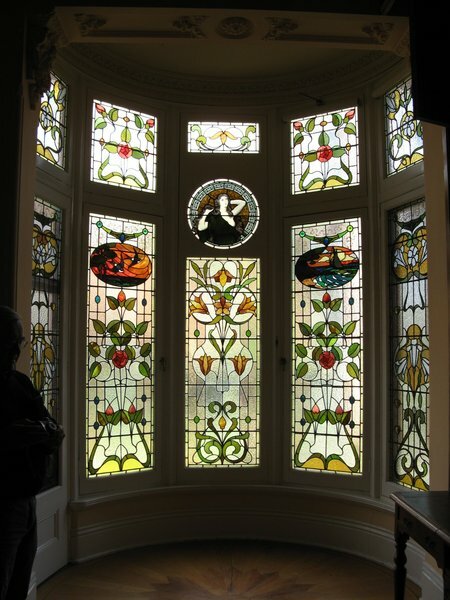 The house has no original furnishings, but it is notable for its magnificent collection of leadlight and etched glass windows, including many incorporating Defence Department motifs, its plaster and pressed metal ceilings, parquet floors, its two unique bathrooms (1904), and its outstanding conservatory (c1880) with 'French antique' ruby glass imported from Italy and floor to ceiling windows of etched glass depicting mining scenes, Australiana and heraldic symbols. 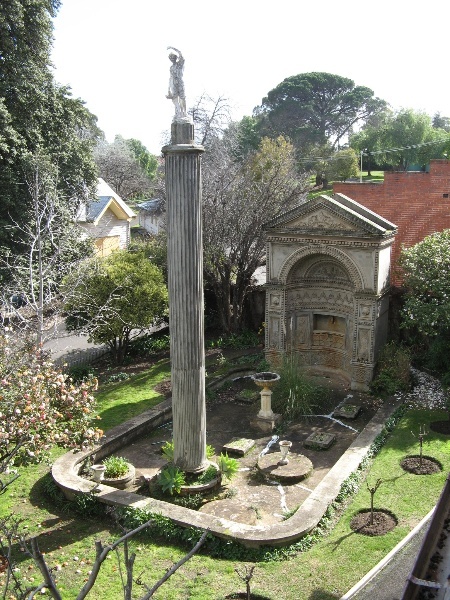 Adjacent to the house is the 'Pompeii Fountain' (c1879), a copy of the one in the House of the Great Fountain in Pompeii which was inspired by Lansell's trip to Italy in 1875, and a fountain and rockery in the south garden. The so-called 'Roman bath' is believed to have been an 1860s tailings treatment pool converted into a brick-walled swimming pool by Lansell (1870s-1880s) and roofed over by the Army. Other early structures associated with the house are a brick laundry (c1904 or 1907) and a former shade house (c1907) south of the house, a stable (1860s) and coach house (1880s) north of the house, and a c1904 garage north-west of the house, used for Lansell's Benz motor car, the first in Bendigo. Of the original garden, only one lake survives, and some pathways around it, as well as a rotunda (1904), a metal-framed rose arbour (c1900), and plantings consisting of conifers, deciduous and evergreen trees, palms, camellias, roses and shrubs, and herbaceous plants, including Abelia x grandiflora, Acer negundo, Acmena smithii, Agonis flexuosa, Aloe arborescens, Araucaria bidwillii, A. heterophylla, Arbutus unedo, Bougainvillea glabra, Brachychiton acerifolius, Camellia japonica cultivars, Cedrus atlantica f. glauca, C. deodara, C. deodara 'Aurea', Citrus japonica 'Variegata', Corymbia citriodora, C. ficifolia, Cotoneaster glaucophyllus, Crataegus crus-galli, Crataegus sp., Cupressus lusitanica, C. macrocarpa, C. sempervirens, C. torulosa, Eriobotrya japonica, Eucalyptus globulus subsp. globulus, E. sideroxylon, Euonymus japonicus, Euonymus japonicus 'Aureomarginatus', Ficus carica, F. macrophylla, Fraxinus angustifolia, Ginkgo biloba, Grevillea robusta, Hibiscus syriacus, Jacaranda mimosifolia, Lagerstroemia indica, Lagunaria patersonii, Magnolia x soulangeana, Mahonia japonica, Malus cv., Nerium oleander, Phoenix canariensis, Photinia serratifolia, Pinus pinaster, P. pinea, Pittosporum undulatum, Populus x canescens, P. deltoides, P. nigra var. italic, Prunus cerasifera 'Nigra', P. persica cv., Quercus canariensis, Q. palustris, Rosa cultivars, Salix babylonica, Sequoiadendron giganteum, Ulmus glabra 'Lutescens', U. minor 'Variegata', Ulmus sp., Viburnum x burkwoodii, Washingtonia filifera, W. robusta, and Yucca filamentosa. The only surviving mining structure is the former quartz-crushing battery (1874, extended 1899), used by the Army as a printing facility. A brick-lined tunnel north of the house may have been associated with the secure loading of bullion onto armed coaches, and may date from the Ballerstedt era. The period of defence occupation is reflected in a number of utilitarian structures, among the earliest of which are two 1940s P1 type huts, which are corrugated steel-clad buildings with low-pitched gable roofs. Archaeological evidence of the historical use and development of the site, including early gold processing activity and residential use, may still remain. This site is part of the traditional land of the Dja Dja Wurrung people. Criterion H Special association with the life or works of a person, or group of persons, of importance in Victoria's history. Fortuna has archaeological significance for its potential to contain historical archaeological features, deposits and objects associated with the establishment, development and use of the place. In particular the battery house is likely to contain archaeological features and relics associated with the operation of Lansell's quartz crushing battery (and possibly remains of an earlier battery belonging to Ballerstedt), and other mining activities. 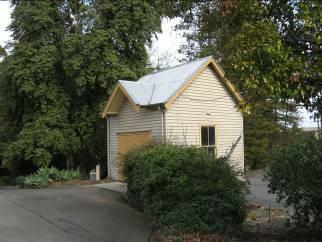 Fortuna is of historical significance at a local level for its association with the history of Bendigo. Fortuna is a historic landmark in Bendigo. It symbolises the founding of the town, and is important as a reference point in the community's sense of identity. Many of the town's citizens have worked on the site and several active community-based social groups have been formed to actively promote the history and importance of the site. The community, through the City of Greater Bendigo, has shown a profound interest in the future of the site. Fortuna is significant for its association with one of Australia's wealthiest gold magnates, Christopher Ballerstedt, who played an important role in the development of Bendigo's gold mining industry. 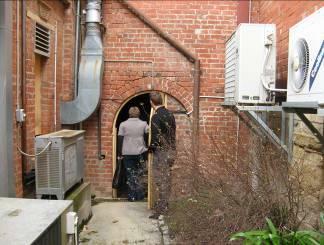 It is a demonstration of the work of the prominent Bendigo architects, Vahland & Getschmann, E Maurmann and W Beebe. 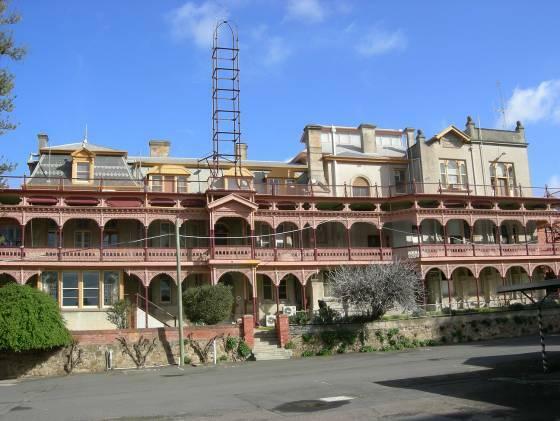 As Executive Director for the purpose of the Heritage Act 1995, I give notice under section 46 that the Victorian Heritage Register is amended by including Heritage Register Number H2211 in the categories described as Heritage Place and Archaeological Place. 1. 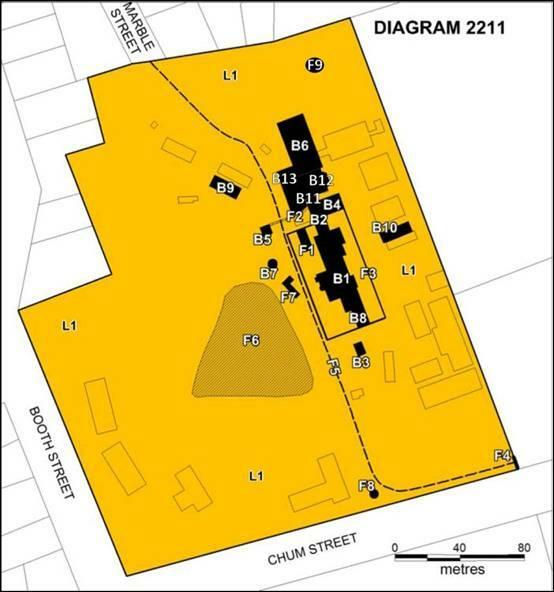 All the land marked L1 on Diagram 2221 held by the Executive Director, being Crown Allotments 1, 1A, 1B, 1C, 1D, 1F, 6 and 7, Section 33B Township of Bendigo. 2. All the buildings and structures B1-10 and features marked F1-F8 on Diagram 2221 held by the Executive Director. General: The landscape and the mature trees. In the 1840s the future site of Bendigo was part of a 118,900 acre (48,120ha) pastoral run. But it was at the centre of Victoria's richest goldfields, and alluvial gold was discovered in 1851 at The Rocks on Bendigo Creek, near present day Golden Square. Thousands of miners swarmed to the area, and in 1855 the town of Sandhurst, later to be called Bendigo, was surveyed. The alluvial gold however was in decline by 1856, and prospectors turned to mining the gold-rich quartz reefs that outcropped on the surface and ran deep underground. By the end of the 1850s new techniques were being introduced for mining these reefs and processing the ore.
During the 1860s reef mining flourished. The significant level of capital required to mine deep below the water table and haul ore to the surface, including the need for steam powered machinery to pump water from the mines and to crush the ores, led to the formation of hundreds of mining companies, often through individual miners combining their capital and assets. Foundries and engineering companies were established locally to supply mechanical equipment to the mines. William Vahland (1828-1015) qualified as an architect in Germany before migrating to Victoria in 1854, reputedly in search of gold. In Bendigo he was unsuccessful as a digger and returned to architecture in 1856, in 1857 forming a partnership with Prussian-born Robert Getzschmann (1818-75), who had migrated to Victoria in 1849. They designed a number of major public buildings in Bendigo, all of which Vahland claimed to have designed. These included the hospital (1858), the Benevolent Asylum (1860 VHR H992), the Mechanics' Institute (1864, VHR H1505), the Wesleyan New Church (1862) and the Lutheran Church (1865) in Bendigo and St John's Church of England in Heathcote (1868). 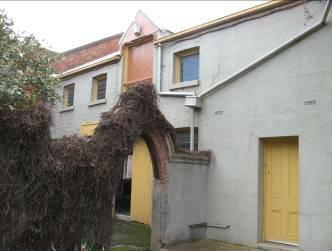 Vahland also designed a number of buildings in Dunedin, New Zealand during 1862-63, but returned to Bendigo in 1863. After Getzschmann died in 1875 Vahland continued the practice alone, and during this time he executed some of his largest works, including the Bendigo Town Hall (1885, VHR H147). 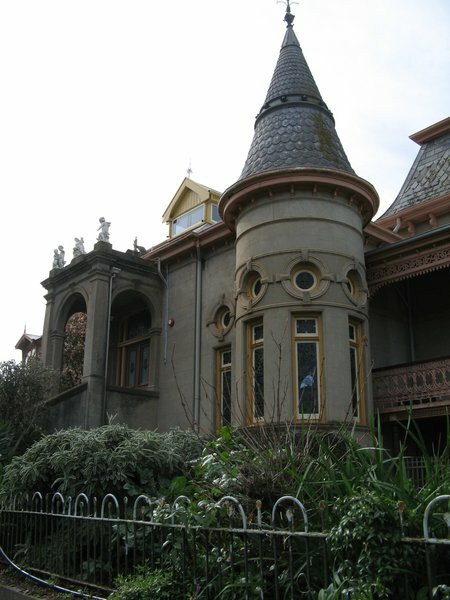 Beebe succeeded Vahland as Bendigo's most prominent architect. Like Vahland he was active in public affairs, receiving an MBE and being the mayor of Bendigo from 1919-27. He was born in Bendigo in 1857 and began work in his father's stone masonry firm, which also undertook architectural commissions. Following his father's death in 1892 Beebe concentrated on architecture and was elected a fellow of the RVIA in 1910. He concentrated largely on domestic and commercial buildings in regional Victoria. J C T Christopher Ballerstedt, a Russian-born German miner who had come to Victoria in 1853 with his family, was one of the early successful reef miners in Bendigo. With his son Theodor he owned a claim at Victoria Hill to the north-west of the town, above the New Chum Gully, where they developed the rich '180 Mine', named after the depth (180 feet) at which the reef had first been found. In 1857 Theodore purchased from the Crown the Fortuna site (Allotment 1 of Section 33B) to the south, which he had been working since 1855. Ballerstedt built a quartz crushing mill on the site to process the ore from his mines, and between 1855 and 1861 he and his son made a profit of £243,000 from the mine. By 1858 Ballerstedt had built a two-storey eight-room brick house next to his mill. There was a detached kitchen to the south and a store to the north between the house and the quartz mill. Between 1858 and 1859 a lookout tower was built above the kitchen, and a billiard room and stable were added adjacent to the store. In March 1869 the local architects Vahland & Getzschmann called for tenders for the addition of a two storeyed gabled wing with three rooms on the south end of the house. The mill was also enlarged and an engine room built, as well as a detached servants' wing with a lookout tower above it further to the south, a detached double-storey stable and a billiard room to the north of the house, with a statue court between it and the house, and a tailing treatment plant. Christopher Ballerstedt died in 1869, and in 1871 his son Theodor sold the Fortuna residence at New Chum, his machinery and his many valuable claims, including the 180 mine, to George Lansell for the extraordinary sum of £30,000, and returned to Germany. George Lansell (1823-1906) was born in Kent, the son of a chandler and tallow boiler. He migrated to Australia with his brother in 1853, landing at Port Adelaide and making his way to the diggings at Echunga (SA). Unsuccessful there, he walked to Bendigo, and established a business as a butcher and chandler. He invested the money he made from his business in various quartz mining companies. He became convinced that the conventional thinking about the depth at which gold could be found was wrong, and sought to find companies that were willing to sink shafts deeper. These early investments were an overwhelming failure, and Lansell had to continually rebuild his finances to a point where he was able to reinvest and buy further shares in many of the local mining companies. In time he acquired interests in almost every reef in the district, with his sound judgement proving most useful in their development and the companies he was associated with increasing their finds at greater depths. Following his purchase of the 180 mine Lansell proceeded to sink it even deeper, and quickly made £180,000 from the gold found in the first stope (level) of the mine. The 180 Mine helped to make Lansell Australia's first gold mining millionaire and one of Australia's wealthiest men. The mine was sunk down to 3,179 feet (almost 1000 metres), making it one of the deepest gold mines in the world at the time. Lansell's other mines continued to be successful in the 1870s, and several of his new mines also struck it rich. He was to become director of the boards of thirty-eight mines, and his influence over local mining was immense. In 1875 Lansell and his wife Bedelia travelled to England and the continent and visited the ruins at Pompeii, which was to inspire the Pompeii Fountain at Fortuna. He later travelled to the United States to look at mining methods, and is credited with introducing new technologies, such as the diamond drill, to Victoria. Following Bedelia's death in 1880 Lansell returned to England to live. The villa was occupied by E. I. Dyason, Lansell's bookkeeper and agent, who kept an eye on his affairs. Whilst in London, Lansell married Edith Bassford, an English girl whom Lansell had met in Bendigo some years earlier, and they had three children in quick succession. In 1887, Lansell received a petition from 2628 men imploring him to return. Bendigo had begun to struggle economically and saw Lansell's presence and leadership as an important boost for the region. Lansell returned that year with his new family, taking up residence at Fortuna once again. Three more children were born to the couple at Fortuna. 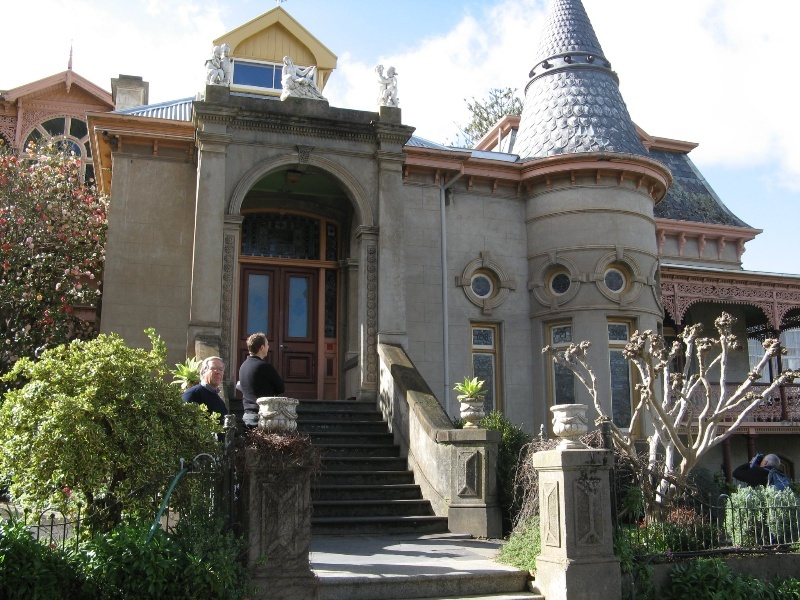 Lansell hosted many prominent guests at his house, including the Prince of Wales and the Duke of Edinburgh, numerous governors of Victoria and artists such as Dame Nellie Melba. After a period of decline in the 1880s, Bendigo's fortunes were reversed in the 1890s. Many of the local mines yielded staggering returns, and under Lansell's leadership his New Red White and Blue mine unexpectedly struck it rich in 1891, becoming a premier mine and continuing to yield abundantly throughout the decade. At Lansell's death in 1906 Bendigo was plunged into mourning, and the Bendigo Stock Exchange adjourned as a mark of respect. In honour of his services to the city a statue was erected to his memory in Rosalind Park (VHR H1774). After 1907 Bendigo's annual gold production declined steadily, culminating in the collapse of the industry during WWI. Declining gold yields, low gold prices and high inflation after WWI led to the closure of some mines in 1922, and many of them became flooded. The Lansell family continued to live at Fortuna until Edith's death in 1934, with Lansell's third son Lionel carrying on the family's mining interests. Following Lansell's purchase of Fortuna in 1871 he altered the quartz mill, excavated a dam, and in 1874 the foundation stone was laid for the construction of a new thirty-head stamper battery. Works to the house and surrounding buildings were carried out almost annually, reflecting Lansell's growing wealth and stature. Most of the works to the house seem to have been carried out by the architects Vahland & Getzschmann. The original entrance of the mansion faced east towards Bendigo and commanded a fine view over the township. Gradually, however, heaps of waste from the processing of ores from the mines surrounding Fortuna encroached upon the view and in 1875 Vahland & Getschmann prepared drawings for alterations involving a new entrance on the western side of the house and a cast iron verandah and balcony (with iron by G C Scott & Co of Melbourne) was added on the eastern side. Following Lansell's return from his trip to Europe in 1876, the walls of the brick house were rendered, and work began on the Pompeii fountain, based on the House of the Great Fountain in Pompeii. 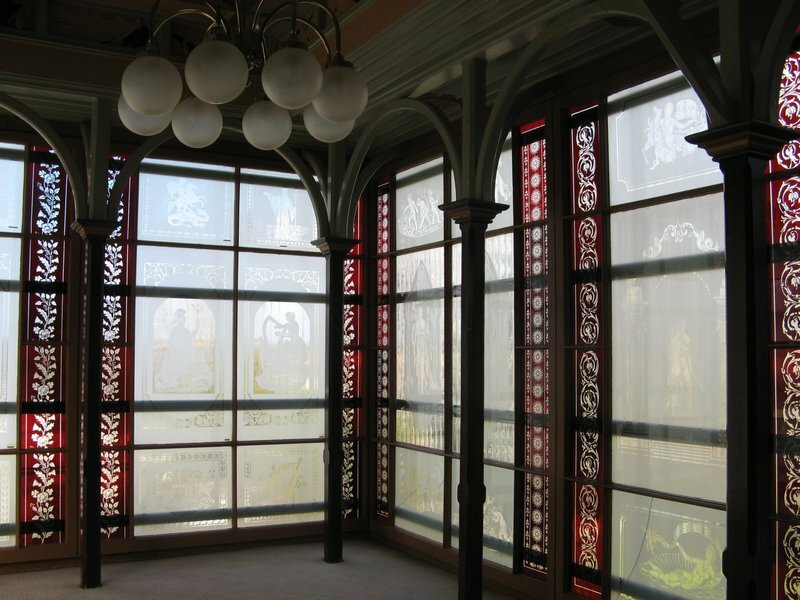 By 1880 the elaborately glazed conservatory was created on the lower level of the lookout. A coach house was constructed adjoining the stables, and the main entrance drive to the villa changed to a southern rather than a northern approach. During this period Lansell also converted the tailings treatment plant to an outdoor swimming baths. Landscaping of the area outside the walled garden began, two Sequoia gigantes were planted on axis at the front of the house, the driveway from Chum Street was fenced and planted with an avenue of eucalypts, and trees were planted to screen the poppet heads of Lansell's 222 and Fortuna mines near the Chum Street entrance as well as the elevated tramway from the 222 to the quartz mill. In the twenty years following Lansell's return to Fortuna from England with his new wife and three children in 1887 he proceeded to beautify the house and garden in a manner 'befitting a prince'. In 1888 Lansell added a three-storey addition to the north side of the building, linking the house to the stables and crushing battery. This included a master bedroom, an adjoining dressing room and a bathroom and toilet, and on the first floor a picture gallery (with a billiard table in the centre) with 22 ft curved ceilings crowned with a lantern light. The whole extension had central heating, the first private residence in the colony to be so heated. In 1890 an attic addition with a mansard roof, designed by the architect Emil Maurmann, was built over the original central section of the house, providing bedrooms and sitting rooms for the staff. Around the house the rose garden was established on the tailing dump to the south of the main lake, the lookout tower on the conservatory was relocated to the rose garden, and numerous statues were added around the garden. In 1893 the upstairs billiard room and picture gallery was converted to a ballroom, and a new billiard room constructed at ground level to the south of the house, to designs by another local architect, William Beebe. 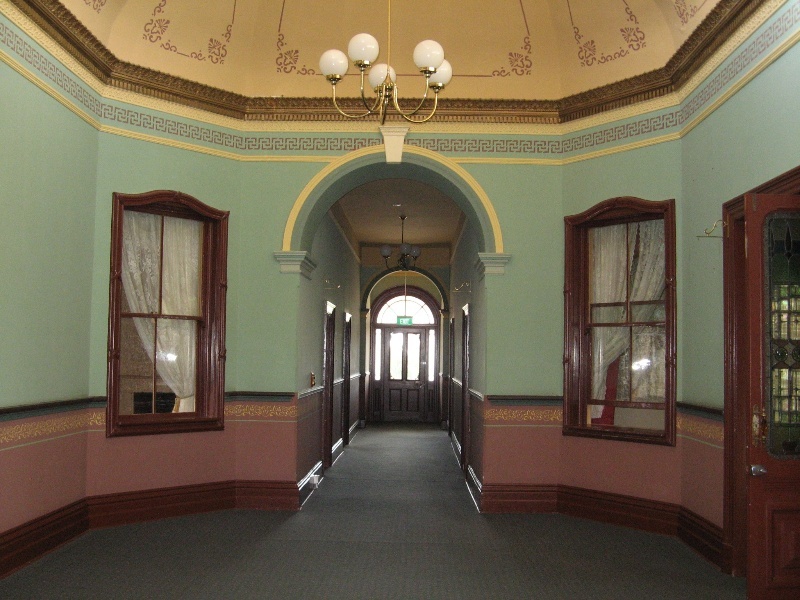 Between 1893 and 1895 a new entrance hall replaced the earlier one, and the music room was extended onto the eastern porch. In 1900 the whole of the eastern front of the house was extended by 4 feet. In the early twentieth century a shade house was built beside the fountain, the quartz-crushing battery was extended, a spacious hall for statuary was added to the lower level of the house, allowing the music room above to be further extended. In the remodelling the distinctive stairwell and cupola were added to the west side. Extensions continued until and after Lansell's death in 1906. Among the additions made by his widow Edith were the conversion of the original large billiard room into an office, and the addition of a gymnasium above this. The house was complemented with extensive landscaping, which included thirteen acres of spacious grounds with five lakes, gazebos, a boat shed and jetties, a tennis court and pavilion, garden seats, a small fountain adjacent to the conservatory, new entrance gates and gravel paths and drives. The ore treatment site at Fortuna, including dams and tailings treatment areas, were progressively transformed into a picturesque garden of Lansell's design. The property at one stage had seven ornamental lakes, each of which had formerly been settling ponds from the ore processing operations. The villa was always remarkable for the fact that it was physically attached to the mining works, the crushing plant being attached to the north wing of the homestead. Edith Lansell died in 1934, and the house and its contents were auctioned. The contents, including many fine artworks, statues and furniture pieces were auctioned first, followed by the house and mining lease 9842, which was purchased by Bendigo Mines Pty Ltd for £2400. The house was subsequently listed for sale or demolition and removal, and was purchased in 1938 by Maud Matilda Mott, who used it for a short time as a reception venue. The outbreak of World War II led to the need for maps, of training areas and for other training purposes, and it was proposed that an independent Military Mapping Agency be established. In 1942 Fortuna was requisitioned by the Commonwealth under the National Security Act 1939, and became the Cartographic Headquarters of the Australian Survey Corps. Strategically it was well located, with good rail communication to both Melbourne and Adelaide. The place was by then rather dilapidated and the gardens were overgrown, and considerable changes were required in order to make the buildings and grounds ready to accommodate the army and its specialist cartographic and printing activities. Men and women of the Australian Survey Corps and the Australian Women's Army Corps worked around the clock producing highly classified documents and mapping for the allied war effort. The former mining processes were largely replaced with new printing facilities, with existing structures adapted and new purpose-built structures added. A new photo-litho building was constructed adjacent to the existing mill buildings, as well as a new toilet and ablutions block, roads, and drainage and sewerage services. The Roman bath was drained and a roof and floor added to provide extra work space. Changes to the grounds were also carried out. Three of the former dried-up lakes were filled in and another, near the front gate, was used as a rubbish dump. Only the largest was refilled with water. P-type huts were constructed on the site, and on the western side of the rose garden (on the tailings dump to the south of the lake) a kitchen, dining mess and three long accommodation huts were added, along with toilets and ablution blocks. The remainder of the rose garden was used for tent accommodation and in the early 1960s became a parade ground. In 1952 Fortuna was purchased by the Commonwealth Government, and in 1955 the Unit was designated the Army Headquarters Survey Regiment, renamed the Army Survey Regiment, which was the largest unit of the Royal Australian Survey Corps. It became a world leader in developing technology for use in automated mapping systems. From the 1960 to 1986 further changes occurred at Fortuna. These included the creation of a parade ground in the rose garden where tents had been located, car parking and roads on the tailings mound south of the lake, and four new buildings for accommodation, barracks and kitchens on the south-west corner of the site. A tennis court, cricket pitch and basketball courts were also added to the north of the lake. During this period the types of trees planted changed to reflect new styles, rather than continuing Lansell-style gardens. The Bush Block in the south-east corner of the site (Lot 2A, not included in the registration), was purchased by the army. A new print room, called Wayzgoose Hall, was built in 1990 on the site of the former foundry. The Army Survey Regiment was disbanded in 1996. The Defence Imagery and Geospatial Organisation (DIGO) occupied the site from 2000. There were periodic upgrades to existing buildings and the construction of new buildings, particularly in the south-eastern sector near the entrance. DIGO moved to another site in 2008. In the 1980s and 1990s, the house was open for public inspection on Sundays. 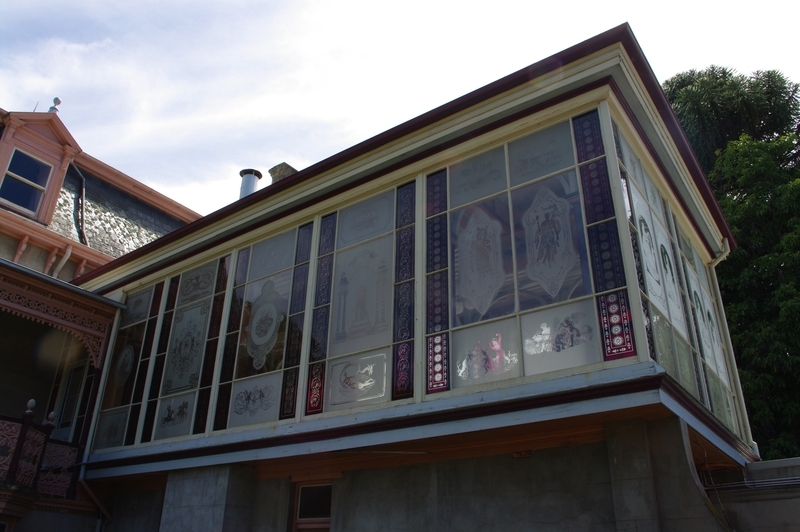 During this time many conservation works were undertaken by the Federal Government's Australian Construction Services, for instance repairing and restoring the glass of the conservatory. Some of the interior decorative treatments (long over-painted) were also revealed and restored. The house ceased to be open around 2000 and was sold into private hands in 2013. Godden Mackay Logan, 'Fortuna Bendigo. Heritage Management Plan. Final Report', Prepared for the Department of Defence, September 2010. Allom Lovell & Associates, 'Fortuna Conservation Management Plan', June 2002. This outstanding mansion and garden were developed from 1857 by the gold magnate Christopher Ballerstedt, and from 1871 by George Lansell, on the waste from their mining operations. The site was used from 1942-2008 by the Royal Australian Survey Corps. All works should be informed by Conservation Management Plans prepared for the place. 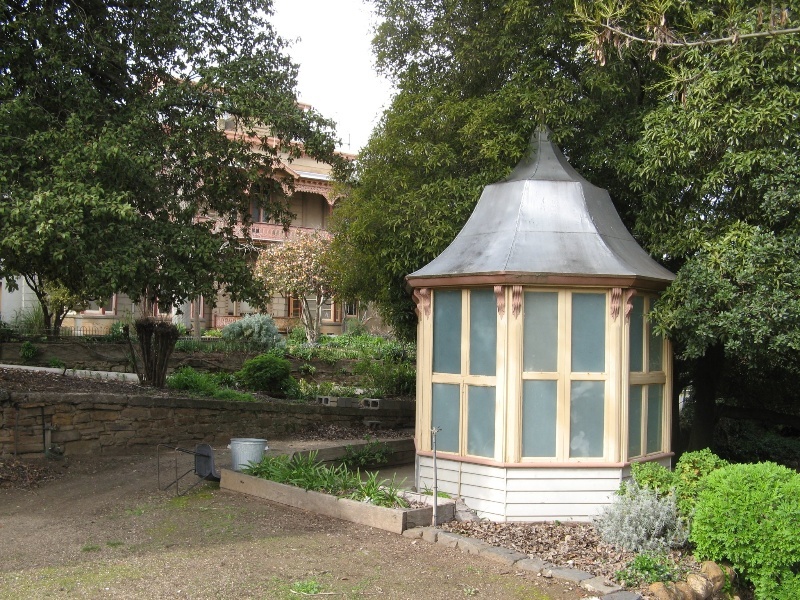 These are: Godden Mackay Logan, 'Fortuna Bendigo - Heritage Management Plan, Final Report', Prepared for the Department of Defence (September 2010); Allom Lovell & Associates, 'Fortuna Conservation Management Plan' (June 2002); and the Garden Conservation management Plan (1996). Nothing in this determination exempts owners or their agents from the responsibility to seek relevant planning or building permits from the responsible authorities where applicable. Note: Any Minor Works that in the opinion of the Executive Director will not adversely affect the heritage significance of the place may be exempt from the permit requirements of the Heritage Act. A person proposing to undertake minor works may submit a proposal to the Executive Director. If the Executive Director is satisfied that the proposed works will not adversely affect the heritage values of the site, the applicant may be exempted from the requirement to obtain a heritage permit. If an applicant is uncertain whether a heritage permit is required, it is recommended that Heritage Victoria be contacted. The two P1 type huts (B9 and B10) may be relocated on the site, subject to a permit. Demolition of buildings and site elements not listed in the extent of registration, subject to full recording to the satisfaction of the Executive Director. This does not include landscape elements or plantings. Refer to the landscape exemptions below.
. Repairs and maintenance works which replace existing to match the original material, or which restore and reconstruct in accordance with the 2002 CMP and 2010 HMP provided the extent of the replacement of existing fabric does not substantially alter the overall appearance.
. Removal of extraneous items of no significance such as pipe work, ducting, wiring, antennae and aerials, and making good using materials and finishes to match the surrounding original fabric.
. Repainting all previously painted surfaces in the same colour and paint type provided the preparation does not remove evidence of earlier paint schemes.
. Non-invasive cleaning including the removal of organic growths, vegetation and surface deposits to built fabric provided there is not damage caused to the original fabric.
. Roof repairs including to slate roofs, providing these are undertaken using materials, details and techniques which match the original including source of slate.
. Appropriate repair and maintenance of gutters, installation of gutter guards, new roof flashings and modifications to roof drainage. Materials, profiles and details to match original.
. Emergency stabilisation works, as notified to Heritage Victoria, to rectify flooding, storm damage, services failure, fire, malicious damage, or other works which if left unattended would result in ongoing deterioration of heritage fabric.
. Works to or removal and making good the steel fire escape stairs to the east elevation of the villa using materials and finishes to match the surrounding original fabric.
. Minor repairs which utilise materials and techniques which match the original, including to walls, joinery and floor finishes.
. Appropriate reversible emergency works to address damage arising from roof leaks.
. Repair and servicing of existing equipment and services including wiring and plumbing. This includes the alteration of fire/phone/IT cabling and the removal of the associated switchboards and services cupboards.
. Installation, removal and replacement of bulk insulation in roof spaces.
. Installation, removal and replacement of smoke detectors.
. Installation, removal and replacement of hot water services provided they are in a concealed location. No roof top mounting of any hot water service unit is permitted.
. Installation, removal or replacement of light switches, additional power points and data points, and electrical wiring provided that all new wiring is fully concealed. This exemption does not cover the removal or replacement of original light switches, pull cords, power outlets etc.
. Installation, removal or replacement of non-original carpets and/or flexible floor coverings providing there is no damage to original floor finishes.
. Installation, replacement or removal of hooks, nails and other devices for the hanging of mirrors, paintings and other wall mounted artworks, including those used to hang extant whiteboards installed during by the Department of Defence occupancy.
. Refurbishment of bathrooms/toilets including removal/installation or replacement of sanitary fixtures and associated piping, mirrors, wall and floor coverings. 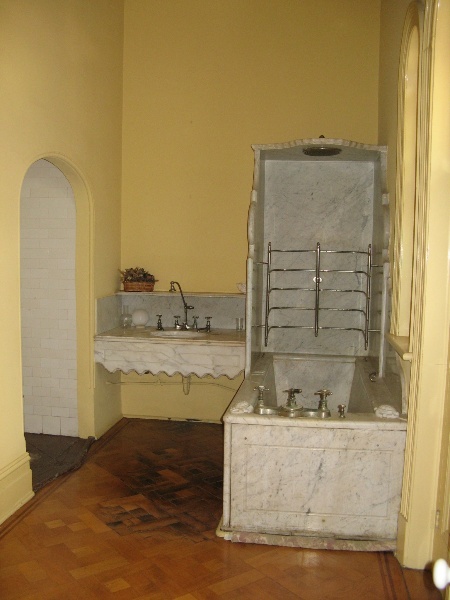 This excludes works to the nineteenth century bathroom fixtures in room 43 and 50 of the villa, as identified on the floor plan in Figure 50 in the 2002 CMP.
. Removal and making good of existing non-original kitchen benches and fixtures including sinks, stoves, ovens, refrigerators, dishwashers etc. and associated plumbing and wiring. This includes kitchen fittings in the villa in room 6 (bar), room 7 (kitchen), room 17 (bar) and room 23 (kitchen) on the lower ground floor and room 46 (kitchenette) on the ground floor, as identified on the floor plan in Figure 49-50 in the 2002 CMP.
. Internal alterations to B6 (Quartz-crushing battery);B11 (former retort building) and B9-10 (P1 type huts) providing these do not change the external presentation of these buildings.
. Regular site maintenance provided the works do not involve the removal or destruction of any significant above-ground features or sub-surface archaeological artefacts or deposits.
. Cleaning out gutters, and maintenance of drainage systems, the lake and other water storage and drainage areas.
. Maintenance and replacement of existing power cables or service pipelines or other public services located on the property where this involves no alteration to the built fabric or impact on archaeological values of the place.
. Maintenance to roadways and pathways including curbing and surfaces.
. 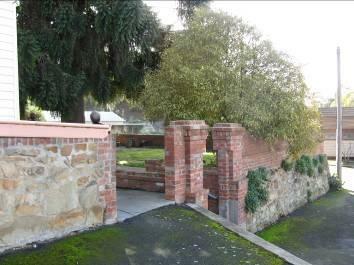 Maintenance works to the rockwork retaining walls providing mortar composition matches original. Minor ground disturbance within the Villa grounds (for example, gardening and landscape maintenance). Should it become apparent during further inspection of works being undertaken that original or previously hidden or inaccessible details of the place, or objects (including historical archaeological deposits, features or relics), are revealed which relate to the significance of the place or object, works are to cease and the Executive Director is to be notified.
. Subsurface works involving the installation, removal or replacement of watering and drainage systems or services outside the canopy edge of significant trees in accordance with .AS4970 and on the condition that works do not impact on archaeological features or deposits and take into account contamination issues.
. 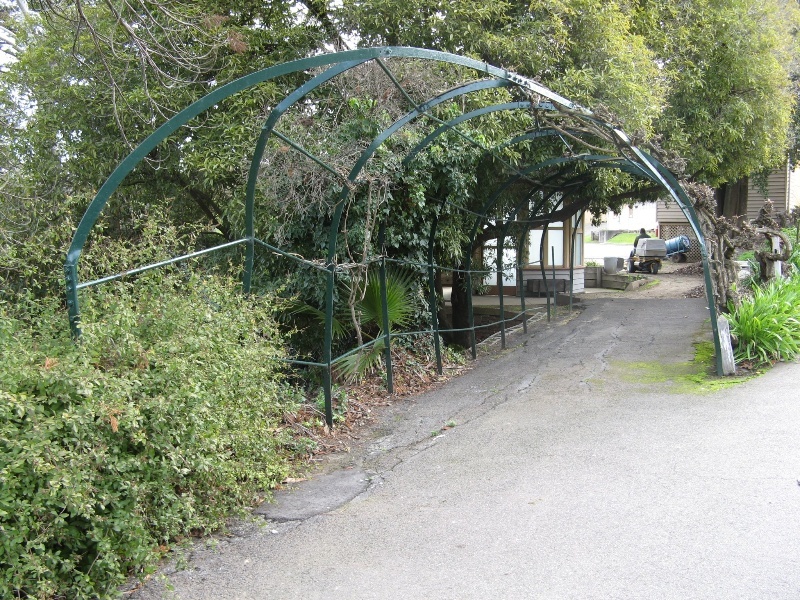 The erection of temporary security fencing, scaffolding, hoardings or surveillance systems to prevent unauthorised access or secure public safety which will not adversely affect the significance of the place including archaeological features. The purpose of the Permit Policy is to assist when considering or making decisions regarding works to the place. It is recommended that any proposed works be discussed with an officer of Heritage Victoria prior to a permit application. Discussing proposed works will assist in answering any questions the owner may have and aid decisions regarding works to the place. Prior to the sale of the place by the Department of Defence into private ownership in 2013, a Heritage Management Plan for Fortuna was prepared by Godden Mackay Logan (2010). The principles and policies within the Heritage Management Plan should guide any future proposals for the place. In addition, the 2002 Conservation Management Plan by Allom Lovell & Associates, and the 1996 Garden Conservation Management Plan by Francine Gilfedder & Associates, and any reviews of these documents, will assist with the future management of the heritage significance of the place. In any future works in the area of the gardens, reference should be made to the condition analysis of the landscape elements in the 2010 Heritage Management Plan by Godden Mackay Logan, and to the 1996 Garden Conservation management Plan, though the site has changed since the 1996 report was written. The extent of registration protects the whole site. 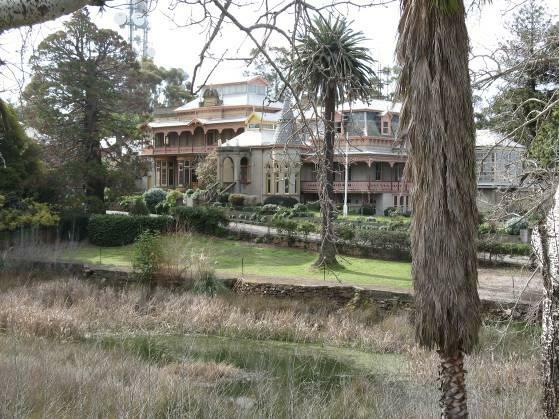 The significance of the place lies in its rarity and intactness as an extensive residence and garden which developed over many years during the nineteenth and early twentieth centuries on top of the waste produced from the processing of ore from one of Bendigo's most successful gold mines, and which was taken over by the Army for its Survey Corps in the 1940s. All of the registered buildings are integral to the significance of the place and any external or internal alterations are subject to permit application. Ground disturbance may affect the archaeological significance of the place and, subject to the exemptions below, requires a permit. Subdivision of the land could also pose heritage issues and impacts and also required a permit. Interpretation of the whole site should be considered prior to any subdivision or major development occurring. A comprehensive heritage interpretation plan should be developed as part of any subdivision proposal. The addition of new buildings to the site may impact upon the cultural heritage significance of the place and requires a permit. The purpose of this requirement is not to prevent any further development on this site, but to enable control of possible adverse impacts on heritage significance during that process. Fortuna's potential historical archaeological significance does not require approvals to be sought for day-to-day maintenance activities, including landscape and gardening works. However, before any activities involving extensive disturbance to sub-floor surfaces, or the use of excavating machinery in and around buildings, former ponds and significant garden or landscape features, discussions with Heritage Victoria are required in order to determine whether permit approval is necessary. A permit is likely to be required for works in the battery shed that will affect the sub-surface component of the building. If any potentially significant historical archaeological features, deposits and/or objects are exposed during any site works, it is necessary for all activities to cease and for Heritage Victoria to be contacted.